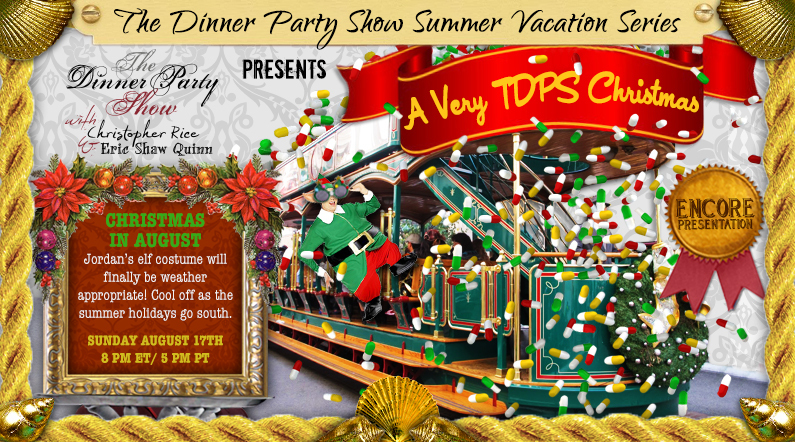 ENCORE: A Very TDPS Christmas! Host Jordan Ampersand and his drug-addled friends descend upon a glamorous L.A. shopping mall to explore the meaning of Christmas! They’re joined by Puffy The Christmas Elf and everyone learns an important lesson about dieting during the holidays. Episode 53 originally aired Sunday, December 22, 2014. Rebroadcast Sunday, August 20, 2014. The Dinner Party Show with Christopher Rice & Eric Shaw Quinn (TheDinnerPartyShow.Com) is a participant in the Amazon Services LLC Associates Program, an affiliate advertising program designed to provide a means for sites to earn advertising fees by advertising and linking to amazon.com. The Amazon logo are trademarks of Amazon.com, Inc. or its affiliates.